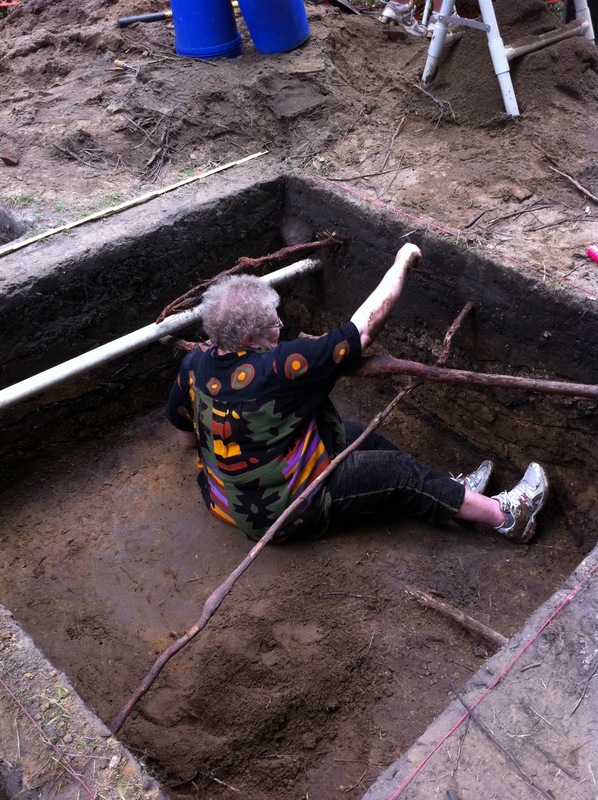 This is my last post for the MSU Campus Archaeology Program (CAP). I am retiring from MSU this summer, and will be moving away from East Lansing. The new Director of CAP is Dr. Stacey Camp, and I am certain that she will do a fabulous job taking CAP (and the past) into the future. Dr. Goldstein cleans up a unit wall. At the beginning of CAP, I don’t know if I really believed we would be able to accomplish everything we have done in the last 10 years, even though we always had very grand goals. Recently, the LEADR Lab (specifically, Alice Lynn McMichael and Autumn Painter) recorded my oral history of the program, and because that will soon be available via a link on this website, I will not go into a detailed history here. The Program began with two of us – Terry Brock as graduate assistant – and me as Director. There was not another program like ours, so we had to invent everything. The University felt that CAP reflected the land grant ethos, and learning by doing is a critical part of the program. When I asked administrators what they expected, they told me that since it was my area of expertise, they would leave those decisions to me. That was an advantage, since there was no clear way to do things, and no one to tell us that we were doing things wrong. For a couple of years, our budget was very small, and I had to convince people in the administration to fund us. Since nothing that CAP does is actually required by law, this required finesse and diplomacy – we could not get angry, but had to teach people what to do when projects were planned, and why funding was necessary. Terry and I hopped onto the social media wagon early. With just two of us, social media allowed us to look bigger and more impressive if we had the energy to tweet and post a lot. People all over the world found us and followed us. We have made many great friends, and our social media strategy has been among the very best things we established. Eventually, with the help of a few select administrators, we got a targeted line-item in the University budget, supplemented by Graduate Fellowship funds from the Graduate School. This base funding has been critical, and allowed CAP to accomplish many things, to experiment, and to fail. Perhaps most importantly, IPF (Infrastructure Planning and Facilities) understands and accepts what we do, and works closely with us on most projects. The CAP Grad Fellows have been amazing, in terms of their work and their imagination. Each of them helps on many of the projects that CAP does, but each also has their own research project that they develop. These projects have been wonderful, and we have all learned so much from them, ranging from sustainability to gender to foodways. Working closely with Archives on all of our work has also been a grand and valuable experience. I will absolutely miss CAP, but am confident that its future is bright. 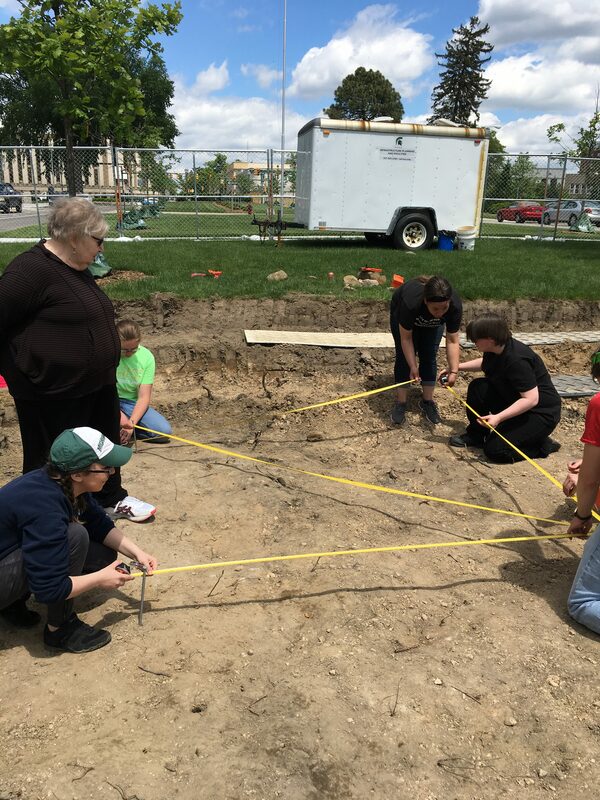 Archaeology on campus has opened possibilities to many students, informed and engaged a variety of stakeholders, as well as highlighting the important archaeology that exists on campus. 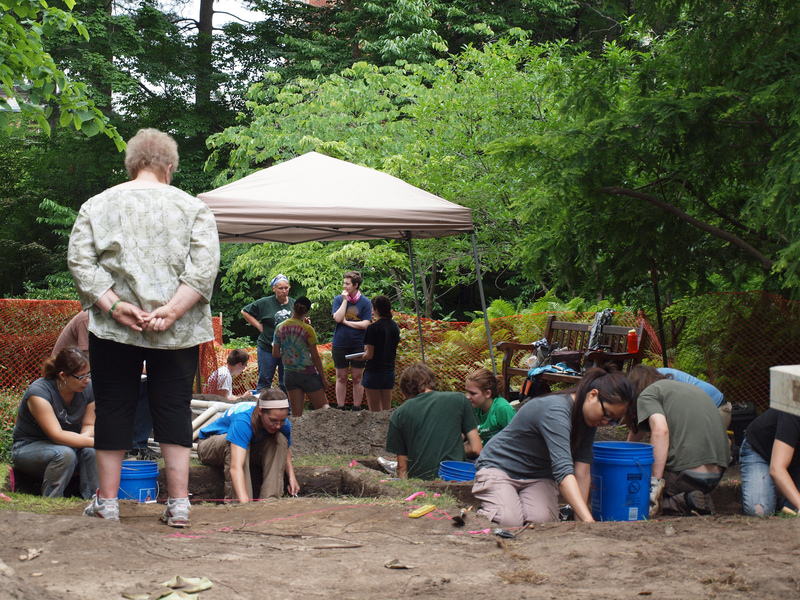 CAP fellows are not limited to archaeology grad students – we have had fellows from all parts of anthropology. Dr. Goldstein teaches the 2017 field school how to lay the perfect 2x2m unit. I am writing and editing a book on MSU Campus Archaeology that will likely be published in 2019; a number of current and past CAP participants will be featured. Keep your eyes on this space for details!